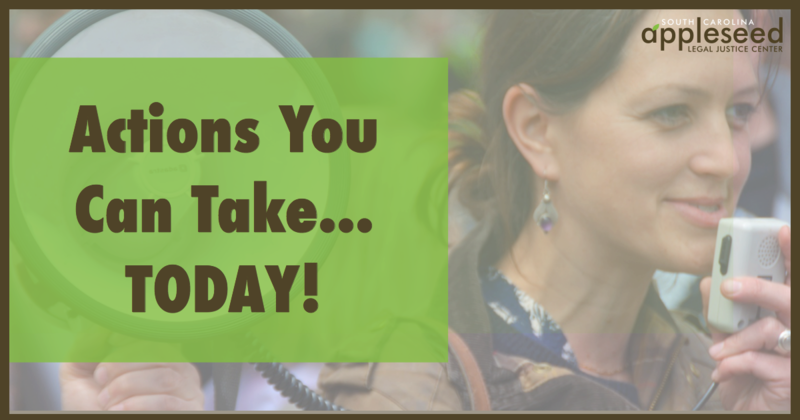 Five Things You Can Do TODAY to make a difference! These days it can be easy to become overwhelmed by all of the difficult and concerning decisions and events happening both locally and at a national level. It can also be easy to feel powerless to do anything to make change. Your voice is important. There are simple things you can do that can have a real impact on issues that matter. Here are five things you can do today to make a difference. Support a local or national organization whose mission aligns with your interest(s) by investing your time and/or money. Letters to the editor and opinion pieces are very powerful advocacy tools. The editorial section of a newspaper is widely read by the public and closely monitored by elected officials. In a letter to the editor or opinion piece, you are able to call attention to an issue you are passionate about, and can create the impression of widespread support or opposition to an issue. Letters to the editor can provide readers with information and insights on issues with which they may be unfamiliar, and can also inspire readers to take action. It is your right to exercise democracy, and a letter to the editor provides a wonderful opportunity to let your voice be heard. At SC Appleseed, we have created two LTE guides. One focused on immigration and DACA, and the other on healthcare. These guides address the how-to’s of LTE writing, and include several points you can use to craft your LTE, and real-life samples. Most LTE’s are short, and some newspapers have different rules, so be sure to check for all requirements before you submit! Targeted calls to members of Congress or other elected officials are a powerful tool to make your perspective known and to advocate for a position. It is important to focus these calls to one primary point and to be very clear what you are asking of your elected official. To find contact information for your member of Congress, enter your address or zip code at https://www.callmycongress.com/. Attend a local meeting, or coordinate your own with neighbors, friends, strangers, or all of the above! There are a large number of groups that have formed across South Carolina and are meeting regularly. Stop by one of those meetings! Each group has it’s own interests and focus, so there is a good chance there is one out there for you. Feel free to start your own group as well! A focused groups with as few as ten people can make a lot of difference and it may allow you to focus on the issues that are most important to you. SC Appleseed loves talking to active and engaged community members! Our staff has expertise in any number of issues. Contact [email protected] to make a speaker request! Your time and financial resources can have an incalculable impact when invested in organizations working toward justice. Whether you are able to help with data entry, canvassing in the community or make a financial contribution, the benefit goes far beyond this seemingly simple act. When you support SC Appleseed or other similar organizations, your actions both small and large are joined with the countless actions of others and together we can make a real difference. You have a key role to play in the daily struggle for justice. No action is insignificant; none to small to be of use. So, these are five suggestions for actions you can take today. Which one will you chose?